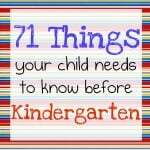 A few months ago I shared a post called “71 Things a Child Needs to Know Before Kindergarten” based entirely on an end-of-the-year assessment given in the Pre-K program where I student taught more than 6 years ago. This post sparked a heated debate and there were a lot of strong opinions expressed in the comments. 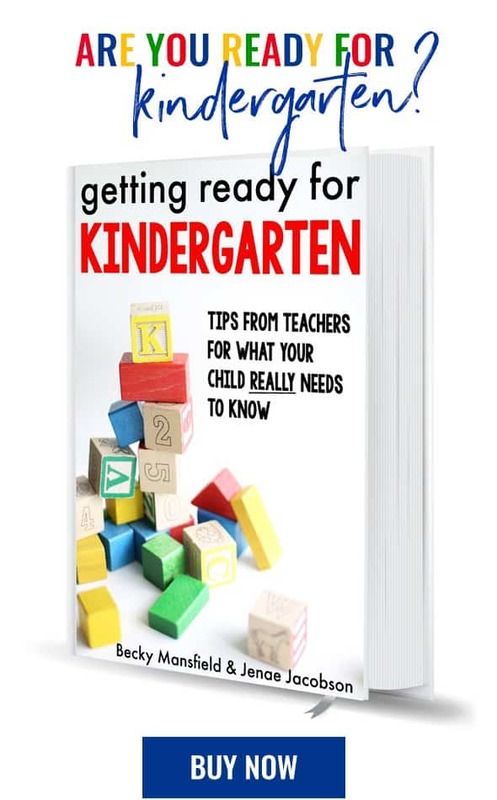 Because of the questions and concerns from this post, I thought it would be helpful to create a checklist for parents with some things YOU can do to prepare your child for kindergarten. And the best part–no flashcards or drill-and-practice memorization!!!! These are simple, everyday things that you can do with your child for just a few minutes at a time to ensure that he/she is ready for school! Just so that we are clear… If your child cannot do everything on this list, it does not mean that he/she is not ready for kindergarten! You are the parent and you must decide what you feel is best for your child. Public schools are equipped with professional educators who will take your child where they are and help them grow and learn from there. Although it would certainly make things easier for your child (as well as the teacher and the other children in the class), this is NOT a pass/fail kindergarten entrance exam! This is just something that should guide what you do with your child prior to kindergarten. 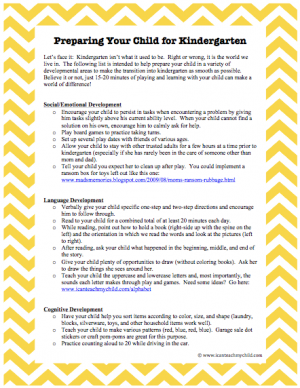 Click on the button above to download and print your copy of kindergarten readiness skills. Thoughts? Any tasks I should add or take away??? I have written an ebook with my friend Becky from Your Modern Family exploring this topic much more thoroughly. You can purchase the Kindle version or the paperback version! I just want to thank you for resources like this to be a support and guide to what we are doing in homeschooling during preschool, thank you!! I just want to say THANK YOU for all the work you put in to creative, clever, useful and well-thought-out resources to post! I have followed you from your blog’s beginnings and have referred so many friends and moms here. I appreciate you! Thanks so much for posting this fantastic list. I am a public school teacher and I am *stressed* thinking about my son (now 3yrs) going into the public school system. I was just explaining to my Mom the other day how much it’s all changed! I think having your resource will serve as a great reminder to keep the focus on connecting and having fun with my child. The rest will fall into place …. I hope. Great list! I think this is a great resource. May I suggest adding something about asking questions to the social or language development category? I have found that a couple of my preschoolers have trouble asking me about the subject we are talking about. For example, I will ask one child, “Ask me a question about the picture, (or story, or shape).” Some children don’t understand what to do because they don’t know what a question is or are not used to asking about those kind of things. I think having the child come up with a question, also helps them make friends, concentrate on the task, and is great for creative play. Just a thought. Thanks for sharing! Thank you so much for putting this checklist together and sharing it. I tried following the link for correct pencil grip, but it gave me ‘”error”every time I tried. Can you please tell me another way to access that post? Thank you. LOVE THIS! Thank you so much for this post! My oldest son is starting kindergarten this fall so it came at the perfect time. For some reason I can’t access this list…every time I click on it my internet shuts down:( Is there anyway you could email it to me? Thank you so much for sharing this, you have no idea how useful it is going to be since we are debating to put my daughter in Knder this year or wait until next year. This list is going to help us. I LOVE this post—thanks for sharing! As a mom to two little ones who want them prepared for kindergarten one day—this is very much appreciated! Great stuff… I would add to visit dentist – FIRST TOOTH, FIRST VISIT! When children have a sore mouth, teeth they will not learn as easily. Also think about socialization – exposing your child to other children in a positive environment – perhaps a play group or a young children organized sport. Again! Great stuff. Thanks for taking the steps to educate your audience! I’m sure someone already pointed this out but you have cutting with safe scissors twice. Thanks for the list it’s a great way to check where we are against where we can get to. Good to stretch ourselves a little. Thanks for the list and for NOT including “kids should know all their letters” to this list which is not age appropriate for preschoolers in the first place. This is something that is stressed so much around where I live and I find it to be too much pressure on the parents to try to keep up with everyone else. Moms and dads, it’s ok if your kids don’t know all their abs before they start kindergarten! What a great list! I would like to add something to the effect of encouraging singing along with children’s folk songs (twinkle twinkle, etc) alone and/or with recorded music. As a music teacher, I see many students that are not comfortable with a singing voice or that do not sing around the home and therefor struggle to find their own voice. In addition to the benefits of a music education in later years, learning this simple skill early on will allow them to benefit from singing as a form of expression from which to choose. It’s a great list…please add the colour grey because that’s the one colour lots of kinders struggle with. Dana…what a great suggestion! My 4 yr old quads go to school next year & I never would have thought about this! Kindergarteners need to know letter sounds. Practice those while reading. Also, they need to know there are times they don’t get the choice to say no or to do something else. Hi there! This is great – My first born is a three year old and we are in a learning rut! This list is a great resource!! I just read both of your lists and these are age appropriate skills that 4 and 5 year olds should possess. The one comment I read that made me cringe was one that said if your child isn’t getting this at preschool, it’s either “just a daycare or a bad preschool”. As a director at a daycare center it can be difficult to convince parents – and sadly even other teachers sometimes – that daycare centers employee the same type of teacher that 1/2 day preschools do, and the education children receive in a daycare center is equivalent to what they receive at a preschool. That being said, the only thing I can see from that list that might be challenging for parents who keep their kids at home is teaching them how to try to resolve conflicts with other children. Children do not behave the same in a large group as they do at home! I think it’s great that you are sharing this assessment tool with parents! Wow….this is great. Printing this off to hang on my fridge. My 4 year old starts his 2nd year of preschool in a week….this is great to see what needs work now…a year prior to him going into Kindergarten. Wonderful information. Thank you! Absolutely love the list!!! My son will start kindergarten in August, and with my hubby and I both working and unable to afford daycare, I am constantly thinking if he will be ready. I feel better in knowing that he is ALMOST there, thanks to your list…you rock!!! This is super helpful. My oldest son is 2 and a 1/2, so it is great to get a list of suggestions of simple activities and projects we can do with him in order to prepare him for a more formal educational setting. Thank you so much! GREAT LIST! Would like to add more self care. 1 teacher with 20+ kids isnt able to put the straw in all their juice boxes or open everything in their lunches! Teach them to open packages of crackers and granola bars, open straws and put them in their drinks. Also have them practice eating quickly and then start adding distractions. Some kindergarteners have lots of trouble being very hungry the 1st few weeks because they have always eaten home alone with no distractions! They only get a few minutes in the lunch room! Also putting their own clothes on, socks, shoes, buttons, snaps, and zippers, hats and gloves! Getting their own coat, gloves, and hat on in the winter and how to hang all these things up when they come off is wonderful! It’s easy for mom to just do it because its fast and easy, but the class would never get outside if the teacher had to dress every child! Like I said, love the list! These are all great ideas to add to the list! Thank you for this! Of course! Thanks so much, Jayfel! Getting your son or daughter reading early is the best way you can prepare them for kindergarten. http://www.GetKidsReading.tk has some really great information on how you can help them at home yourself in just a few minutes day. web site iis really remarkable. Very helpful list Jenae! I have a toddler and we are already working on a few things. It’s the things like standing in line and waiting your turn that are good to be reminded of because he doesn’t have to do that at home. Thanks! this is so great! very effective to my 2 year old daughter. good luck to all moms. Thanks for this list. I have one mother who is putting a lot of pressure on her child. She is focussing on the academic areas and not realising other skills are important too. I also have a support teacher who is the same. I know this will be helpful. Dan, I agree that reading is important, but again, there are other skills that equal it. I have seen 3 year olds that can read, but they can’t eat solid food, dress themselves, interact with their peers or be independent. The parents focused so much on their children being advanced readers, that they neglected most other areas. Dear Jenae, thank you so much for this website. It encourages me to see that I am on the right track with my kids by already doing these 33 things. I love your ideas for play- learning. My kids learn best by hands on teaching! This is fabulous! This post sparked a heated debate and there were a lot of strong opinions. Public schools are equipped with professional educators who will take your child where they are and help them grow and learn from there. http://camelotkids.org/ also give that type of views. Thanks for sharing, Jenae. Keep it up! Jenae, your piece of writing does seem like a very detailed study of life-focusing tactics, especially being important to parents showing them real fun while handling their kids. As parents, which strategies we would build while making our child to go to kindergarten is really helpful. Parents may or may not have difficulties doing so, more or less. Amongst, the tips provided by you do sound quite practical like a solution gotten from the proven instances of our live lives. Good to go with; just keep it up posting such insights! Thank you so much for providing a lot of useful information and awesome ideas! Brilliant work! As a pre-school teacher honestly I’m shocked by this list. I agree that certain things e.g. spending time with other adults and children can help a child transition to kindergarten/school /daycare but the idea that children need to be prepared for kindergarten by having skills such as knowing their letters and numbers is outrageous. If children are ready for these skills by all means capitalize on their interest and encourage their learning, however children shouldn’t be pushed into this learning, in fact doing so when they are not at the right stage can be detrimental to their development. Parents are their child’s first teachers, they are the ones who know their child best and I don’t think their quality time together should be based on a checklist. Children will have enough pressure on them as they get older, let them have fun and while they can. This is a great list especially for parents sending their first child to kinder.Unfortunately many preschools don’t prepare their little students enough and busy parents assume that what their kids are learning at preschool will be adequate to start kinder with..was a rude shock for us.. Your list is fantastic. I would encourage parents to notice rhymes when reading, and teach children to hear alliteration, when the words begin with the same sound. This list is great, but the more parents can talk to their children and have them discriminate sounds, the easier reading will be. These are wonderful resource tools. Are you doing anything to distribute this information to places where expecting parents can have access to them, such as neonatal care centers, Obstetricians, Family practice doctors, Certified nurse-midwifes, etc.? If not, and if you are interested in doing so, you might contact insurance companies and ask if they distribute literature or information to any of these places, and ask if they would be willing to include your resources. Just a suggestion. I would also like to add that when congress put out their “No Child Left Behind” policy, I knew it was doomed to fail, because it did not include this information. You can not improve the education system in this country if you don’t teach parents how to prepare their children for school. This is not a blame on parents. We are not born with the knowledge of how to be a good parent, we must learn it. If people are not taught how to become good parents, it is very difficult for them to do so. This information needs to be available to all parents and expecting parents while it’s useful for them to have it. Wow..I know that I can use this list as a general perimeter for the things my grand daughter needs before kindergarten. She has a slight speech impediment and a very short attention span. Being Grammy gives me the opportunity to have a day a week with her to hone in on the little things that will be big things if not caught now. I’m her fun get away from mom and dad. I do teach her lots of things in a positive way. She has been in preschool care facility since 6weeks old. A new baby sister has taken the spotlight off her unfortunately. She is 5. She didn’t make it to kindergarten this year. Her birthday was only 2 weeks out. I now have what I can do to help her learn more acurately the things she needs to. Mispronouncing words was treated as cute and funny by mom and dad. I’ve been gently breaking the habit so she isn’t pointed out in school. I hated my kindergarten and 1st grade teachers for that. Calling a child out on the carpet and publically scrutinizing them for something they did not have the tools to change is humiliating. She’s very sensitive and always wants to do good. Thank you for pointing out twice to use the child safe scissors. You can not stress safety ever enough. Just outstanding work when we take what we need and just hold the rest until they are ready. I think readers forget that this is just a guideline for each child. That each child is different in their learning abilities. We as adults need to be taught how to effective prepare our child for school. Every daily activity is important. Again..thank so much. You surely brightened my day! I really like your tip about giving your child plenty of time outside. That is really important because they have a lot of energy build up staying indoors. My husband and I are going to be starting our son in kindergarten in the next few months so we will have to keep these tips in mind. Thank you for sharing! I liked when you said that reading to your child and then asking what was it that you read about can help them perform better at school. I can see what this can help children pay attentia=on and process the information. I would want my child to have a good time at school and retain what they learned. I just want to say AMAZING! I loved your tips and I am definitely going to share your work with the playgroup school parents to help them better understand the need for their child.